9964 Paglight PP90 Request your price! 9956 Paglight XLR-4 Request your price! 9965 Paglight Snap-on compatible Request your price! 9966 Paglight SX compatible Request your price! 9944 Paglight PP90 (with Softstart) Request your price! 9945 Paglight Snap-On compatible (with Softstart) Request your price! 9946 Paglight PP90 (with PowerMax/Varilux) Request your price! 9947 Paglight XLR-4 (with PowerMax/Varilux) Request your price! 9948 Paglight Snap-On comp (with PowerMax/Varilux) Request your price! 9873 Paglight Kit 12V 5Ah Request your price! 9874 Paglight Kit 12V 7Ah Request your price! 9875 Paglight Kit 12V 10Ah Request your price! 9876 Paglight Kit 13.2V 5Ah Request your price! 9877 Paglight Kit 13.2V 7Ah Request your price! 9878 Paglight Kit 13.2V 10Ah Request your price! 9825 Paglight Powerarc Field Kit Request your price! 9939 Jack Cardiff Pro-Shooters Paglight Kit (2-heads) Request your price! 9031 Paglight L24, 250W 24V Request your price! 9032 Paglight L30, 250W 30V Request your price! 9033 Accessory Kit Request your price! 9041 Paglight L24 Kit, 24V 5Ah Pagbelt IC2 Request your price! 9042 Paglight L24 Kit, 24V 7Ah Pagbelt IC2 Request your price! 9043 Paglight L30 Kit, 30V 5Ah Pagbelt IC2 Request your price! 9044 Paglight L30 Kit, 30V 7Ah Pagbelt IC2 Request your price! 1001 Paglight C6 Kit Request your price! 9001 Paglight M PP90 (500mm) Request your price! 9001L Paglight M PP90 (1.5m) Request your price! 9002 Paglight M XLR-4 (1.5m) Request your price! 9003 Paglight M Snap-On compatible (500mm) Request your price! 9004 Paglight M SX compatible (150mm) Request your price! 9007 Rotatable Accessory Kit Request your price! UL2-6 8575-0009 UL2-6 UltraLight camera mounted light with 6” PowerTap cable, diffused glass, Universal mount and AB-60 bulb. Request your price! UL2-20 8575-0006 UL2-20 UltraLight camera mounted light with 20” PowerTap cable, diffused glass, Universal mount and AB-60 bulb. Request your price! UL2-LONG 8575-0007 UL2-LONG UltraLight camera mounted light with 42” PowerTap cable, diffused glass, Universal mount and AB-60 bulb. Request your price! UL2-6 base 5805-0190 UL2-6 base UL2-6 Base Assembly Request your price! UL2-20 base 5805-0192 UL2-20 base UL2-20 Base Assembly Request your price! UL2-LONG base 5805-0194 UL2-LONG base UL2-L Base Assembly Request your price! S-2000 Stock The new professional S-2000 camera light combines 4 advanced LEDs with SWIT optic technology design. S-2000 has improved lumen output 50% more compared with the same category of products in the world in much smaller volume. It offers high output and consumes low power with the unique LED technology. The output is equivalent to a 40W bulb at 5600K° daylight color temperature while requiring only 12W of power with low heat radiation. S-2000 has the long lifetime over 100,000 hours, requiring no dichroic filter and spare filament bulbs.With the color compensating filter you can also change to 3200K° and the new dimmer enables you to adjust the illuminace easily. S-2010+7200F Stock The new professional S-2010+7200F camera light combines 4 advanced LEDs with SWIT optic technology design. S-2010 has improved lumen output 50% more compared with the same category of products in the world in much smaller volume. It offers high output and consumes low power with the unique LED technology. The output is equivalent to a 40W bulb at 5600K° daylight color temperature while requiring only 12W of power with low heat radiation. S-2010 has the long lifetime over 100,000 hours, requiring no dichroic filter and spare filament bulbs.With the color compensating filter you can also change to 3200K° and the new dimmer enables you to adjust the illuminace easily. The S-2010 is uniquely designed and supplyed with DV camera bracket S-7200F/P/J. Request your price! S-7012 Light compact kit include a set of super focusing light, a battery with charger and other accessories. SWIT light kit is perfect in application of high intensity, long time and big scope lighting and is available in both hand taking and camcorder mounting. Dimension 40 x 32 x 12cm Request your price! o 35 x 35 x 7 cms, 3.77kgs/ 8.3lbs Request your price! o 35 x 19 x 7 cms, 2.75kgs/ 6.1lbs Request your price! o Max height 260cm, min height 91cm, weight 1.7kgs/ 3.7lbs Request your price! o Weight 175g/ 0.4lbs, output 7.2W, beam angle 60 degrees, battery life 3hrs Request your price! o Compact travel case Request your price! scrim set (1 each of full double, full single, half double, half single) in a kit case Request your price! scrim set (1 each of full double, full single, half double, half single), 3 Mercury stands in a kit case Request your price! carry case Request your price! with 16mm spigot, 3 Spartan stands, carry case Request your price! Spartan stands in a kit case. Request your price! set, 3 x stands, 3 x 230V, 500W lamps, 1 x flight case) Request your price! set, 3 x stands, 3 x 240V 500W lamps, 1 x flight case) Request your price! set, 3 x stands, 3 x 230V, 650W lamps, 1 x flight case) Request your price! set, 3 x stands, 3 x 240V 650W lamps, 1 x flight case) Request your price! KIT-15 PORTABLE LIGHTING KIT X 3 - Basic 3200°K; Contains 3 Gullivers 30 300W 120/240V, 3 barndoors, 3 safety glasses, 3 stands 106, 6 lamps 300W, (3 foc) - With Fly case Request your price! KIT-15-DIM PORTABLE LIGHTING KIT X 3 - Dim 3200°K ; Contains 3 Gulliver 30 300W 120/240V, 3 barndoors, 3 safety glasses, 3 stands 106, 6 lamps 300W, (3 foc) - With Fly case Request your price! WE KIT-15 PORTABLE LIGHTING KIT X 3 - Basic 3200°K; Contains 3 Gullivers 30 300W 120/240V, 3 barndoors, 3 safety glasses, 3 stands 106, 6 lamps 300W, (3 foc) - With Cordura soft case Request your price! WE KIT-15-DIM PORTABLE LIGHTING KIT X 3 - Dim 3200°K; Contains 3 Gullivers 30 300W 120/240V, 3 barndoors, 3 safety glasses, 3 stands 106, 6 lamps 300W, (3 foc) - With Cordura soft case Request your price! KIT-16 PORTABLE LIGHTING KIT X 3 - Master 5600°K; Contains 3 Gullivers 30 300W 120/240V 3 barndoors, 3 daylight filters, 3 diffusion filters, 3 stands 106, 3 filter pouches, 6 lamps 300W (3 foc) - With Fly case Request your price! KIT-16-DIM PORTABLE LIGHTING KIT X 3 - Master 5600°K; Contains 3 Gullivers 30 300W 120/240V 3 barndoors, DIM 3 daylight filters, 3 diffusion filters, 3 stands 106, 3 filter pouches, 6 lamps 300W (3 foc) - With Fly case Request your price! WE KIT-16 PORTABLE LIGHTING KIT X 3 - Master 5600°K; Contains 3 Gullivers 30 300W 120/240V 3 barndoors, 3 daylight filters, 3 diffusion filters, 3 stands 106, 3 filter pouches, 6 lamps 300W (3 foc) - With Cordura soft case Request your price! WE KIT-16-DIM PORTABLE LIGHTING KIT X 3 - Master 5600°K; Contains 3 Gullivers 30 300W 120/240V barndoors, DIM 3 daylight filters, 3 diffusion filters, 3 stands 106, 3 filter pouches, 6 lamps 300W (3 foc) - With Cordura soft case Request your price! 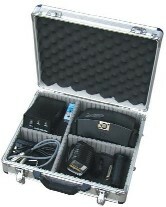 WE KIT-19 MIX PORTABLE LIGHTING KIT - Contains 1 Dedolight 24V 150W, 1 Trasf. Dimmer, 1 barndoor, 2 lamps 100W 12V (1 foc), 2 Gullivers 1760DIM with dimmer , 2 barndoor, 4 lamps, 300W (2 foc), 3 stands 106 - With Cordura soft bag Request your price!